Infographics are great. They are easy to share and help us visualize the important elements we desire to learn. Who would read a block of text when the same information could be presented to you with a neat picture? Studies show infographics are liked and shared three times moreoften than articles or videos. You can find infographics about everything. From the US presidential elections to weird ice cream flavors and dog breeds that can land you dates. There are even infographics about infographics! 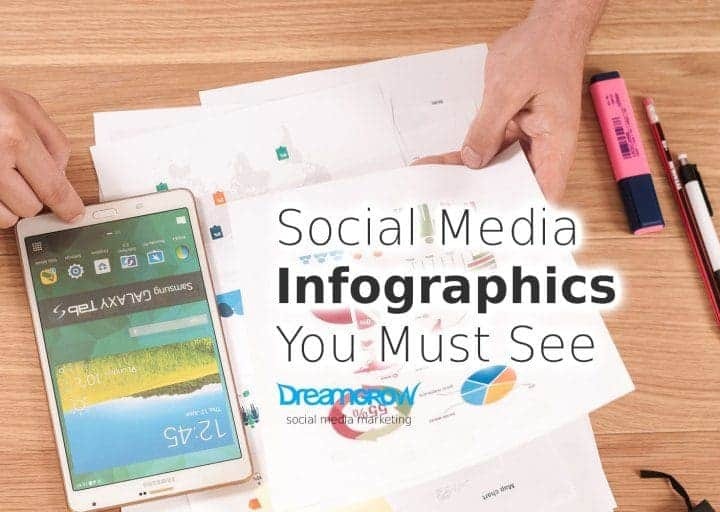 Here are some social media infographics that stand out from the rest and give you some really valuable insights. Make sure you also take a look at Why Their Infographics Go Viral and Yours Don’t. Let’s start with an oldie but goodie. Here’s the best social media strategy infographic I have come across so far. It’s inspired by the work of Convince & Convert. It doesn’t matter whether you are new to social media marketing or have been doing it for years, these agnostic steps will tell you if you’re doing it right. The infographic is simple yet effective. So, what’s your ONE thing? If you don’t have a strategy in place, it’s more than likely that you will only accomplish mediocre results. Do you want that? Of course, you don’t! We have created an infographic to visualize the process of creating your social media strategy. We took inspiration from Facebook’s original timeline design to visualize the infographic. See our post for an in-depth guide to creating your social media strategy! Social influencers are one the most powerful figures these days. They can build your brand, and they can also destroy it. Did you know that people trust influencers as much as they trust their friends? This awesome infographic by Contently tells more about why influencer marketing works so well. And how to incorporate influencers to help you grow your business. Check out influencer marketing guide. Even though social media tools are there to help you out, the great number of available options can confuse you instead. Well, not anymore. Here’s a great infographic by Social Media Strategies Summit that rounds up the 25 most awesome tools. Find the best options for social listening, monitoring conversations, optimizing campaigns or identifying your most relevant social influencers. You have probably noticed how video content is taking over social media. If you want to succeed in video marketing, you need to succeed in YouTube first. The channel has more than 1 billion users and its popularity continues to grow. Take a look at this infographic by WeAreTop10. It will teach you everything you need to know about how create a successful YouTube channel. 6. How Powerful Will Video Marketing Become? Read our commented blog post about the growth of video. When we talk about social media marketers, we often focus on millennials. But almost every generation is using social media these days. Your mother, grandmother and your little nephew – all of them have at least a Facebook account. This infographic by WebpageFX tells you where different generations are in social media. And how to get them on board. Can you post to social media any time you get the inspiration? You can but you shouldn’t, if you don’t want your message to go to waste. Some times are a lot better than others depending on the channel you are using. Check out this infographic by Shortstack. It tells you the best times to post on Facebook, Twitter, LinkedIn, Pinterest and Instagram. It’s no secret that Snapchat is one of the most influential players in social media today. Although the success of this platform has been undeniable, some brands have struggled to utilize Snapchat correctly. MDG Advertising has created this infographic to help you out. It answers to all the tricky questions businesses ask when it comes to utilizing this growing platform. Snapchat – the rising star in social media marketing. The infographic looks at the growing popularity of the app and how business owners can utilize Snapchat to expand the reach of their business. Did you know that there are already over 200 million active users on Snapchat? Read the full post with additional comments about Snapchat marketing. Do you have a social media calendar yet? If not, this infographic by Hubspot will convince you why you need an editorial calendar and how to create it. Remember: social media drives ROI only if you do it correctly. So, social media calendar is the first step in showing what a serious and strategic social media marketer you are. Because you are, aren’t you? Let wrap it up with our very own infographic on Facebook’s sizes and dimension. Do you know what is the Facebook profile picture size? How wide is the page of your brand? What’s the maximum video upload size? Here are all the freshest numbers you need to create a neat Facebook presence for your brand. Creating epic content is hard work and takes a lot of time. The work you put in means that every time you create a valuable content you need to make sure that it spreads as widely as possible. When I was looking for ways to get most out of a single piece of content I came up with this model. Several years back when I started using this concept, it didn’t even have a name. Now it does Content Atomization. You can also look into content upcycling to get more mileage out of your hard work. Read the full post with additional explanations and tips: Content Atomization: How to Build a Social Media Bomb or download for printing in PDF format. Live streaming is one of the fastest-rising tools of the social media trade. After Twitter acquired Periscope back in 2015, it propelled live streaming at the top of the freshest social media features with thousands of users as both viewers and creators. 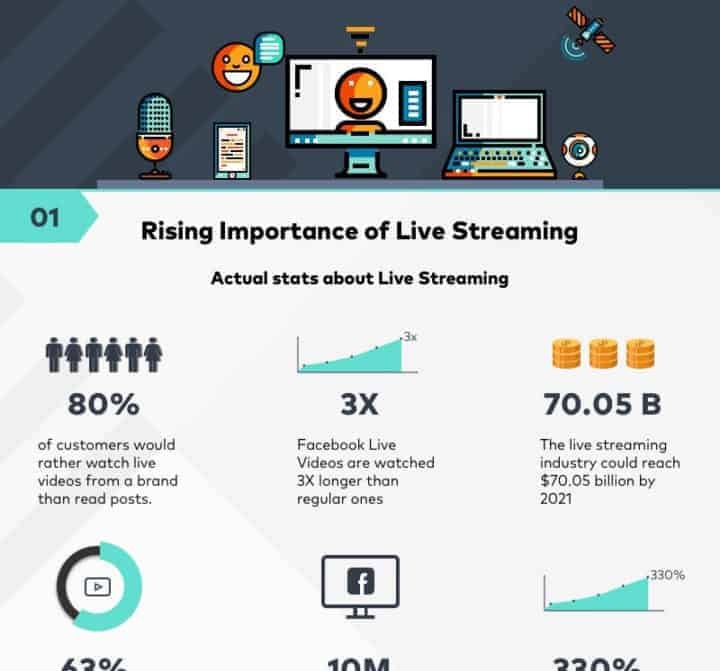 A wonderful infographic by Filmora has a lot of very interesting facts and stats about live streaming in social media. If you are at all interested in it, you should take a look at the infographic right away. Have you come across any cool social media infographics lately? Let us know in the comments. Every infographic has a lot of knowledge to offer and conveyed very clearly. Infographics are not blurry which is very good. I’m learning social media marketing and this is very helpful. Thank you very much for consolidating all these fascinating infographics. WOW, thanks for this infographics, this is very helpful. Some cool infographics. I loved the snapchat 101. Getting a smaller snapshot of data can help when you’re dealing with numbers in the millions. Its easier to get perspective with smaller numbers.